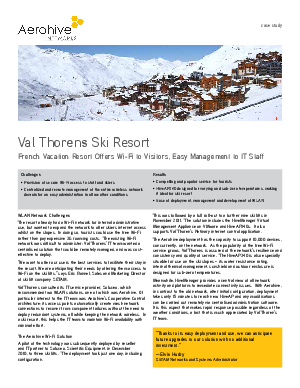 The resort already had a Wi-Fi network for internal administrative use, but wanted to expand the network to offer skiers internet access whilst on the slopes. In doing so, tourists could use the free Wi-Fi rather than pay expensive 3G roaming costs. The existing Wi-Fi network was difficult to administer. Download to find out the benefits of using Aerohive Wi-Fi solutions.